Researchers in Japan are hoping somebody on Vancouver Island will help them locate an important piece of scientific equipment that recently completed a long voyage across the Pacific Ocean. Sam Chan, an associate professor at Oregon State University who studies aquatic invasive species, says the device has been helping track the movement of marine debris after the tsunami. "The marine debris that was moved out by the Japanese tsunami in 2011 actually carried with it organisms. These transponders can help us explain how some of these organisms are able to survive long journeys." Recently the device was spotted off the West Coast, said Chan. "It's had many years in the water and about four months ago, its signal indicated that it was actually hovering off Vancouver Island." Now researchers believe the transponder was picked up by somebody and taken to Campbell River. Although the device reports its position through satellites, it contains other data that need to be physically downloaded. 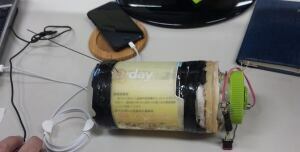 Chan says the device contains information on how to return it, and he's hoping that's exactly what who ever picked it up will now do. 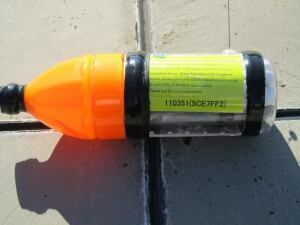 Last summer, another transponder was found off the coast of Haida Gwaii. The transponders were released from northern Japan between June 2011 and January 2013. The batteries tend to last about three years, after which they no longer communicate their location. You can view the tracking information on the university website. A large amount of debris from the tsunami has washed up on the West Coast since 2011, including fishing boats, a barge and a Harley Davidson motorcycle in a shipping container.